Note: Robert Amsterdam is a Canadian attorney based in London who has represented government officials, corporations and human rights activists around the world. He is working with the Turkish government on litigation involving Gulen. In the aftermath of the violent attempted military coup launched against the Government of Turkey on July 15-16, urgent questions have been raised regarding the role of the self-exiled cleric, Fethullah Gülen, resident in Saylorsburg, Pennsylvania. Gülen is not your typical radical. You won’t find him posting incendiary videos to the Internet or directly calling for violence or revealing his agenda to the public. He’s actually much smarter and more dangerous than that. For years, he and his extensive hierarchy of loyalists have worked from behind closed doors in his mansion in the Poconos, where he has established more than 160 charter schools (via secretive front companies), 55,000 businesses operating worldwide, and thousands of members embedding themselves throughout the media, government, and military in Turkey. In Turkey, people are not fooled by Gülen’s act. When the attempted coup took place, Turkish citizens flooded into the streets and risked their lives not to cheer on Gülen, but to resist the putschists and send them back to their barracks. The issue of his involvement in this attempted overthrow is a matter of general consensus – even those opposed to President Recep Tayyip Erdogan acknowledge the link. But here in the United States, regrettably, it’s another story. Many members of the media (as well as many politicians benefitting from the largesse of his donations) treat Gülen with naïve acceptance of the “moderate Islam” narrative they are presented with while never questioning the vast array of inconsistencies, half-truths, and direct involvement in criminal activity. Among Gülen’s leading U.S. supporters is the former high-ranking CIA officer Graham E. Fuller, who writing in the Huffington Post on July 22, described the Hizmet network as “one of the most encouraging faces of contemporary Islam in the world.” As he acknowledges in the piece, he played a key role as a character witness in protecting Gülen from deportation. 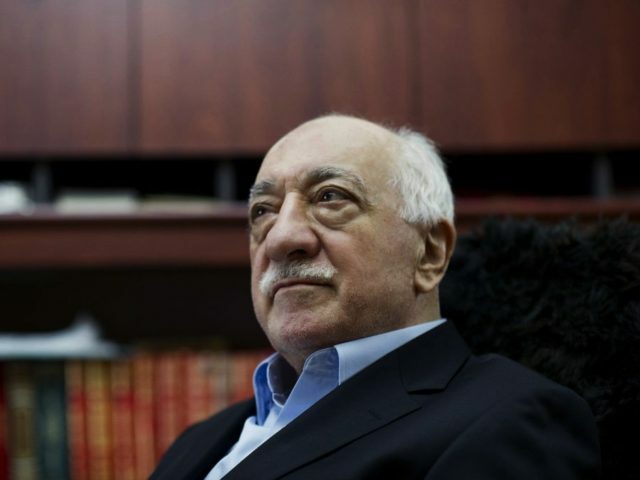 Despite USCIS’s misgivings, Gülen won his appeal in 2008 largely due to Fuller’s support and has enjoyed permanent residency in the United States ever since. Fuller and other supporters high up within the U.S. intelligence apparatus are mistaken with regard to the intentions and risk posed by this organization. Years before the attempted coup took place, Gülen himself ordered his followers to secretly penetrate key state institutions, instructing them to “move in the arteries of the system without anyone noticing your existence until you reach all the power centers.” He then instructed them to lie about ever receiving such instructions. The Gülen organization practices what academics describe as “strategic ambiguity” – which means that they habitually conceal all connections while consistently and regularly denying the scope and purpose of their operations. As a telling example of this strategic ambiguity and the exploitation it enables, three Gülen charter schools were closed in Georgia after a series of forensic audits uncovered the schools’ use of a fake educational services vendor, the Grace Institute. Over the course of our investigation into unlawful activities at Gülen’s U.S. charter schools, we have interviewed numerous whistleblowers and former teachers. The disturbing revelations very much point to the Gülen organization operating as a cult. Former teachers have disclosed abusive treatment of Turkish nationals secured as employees of these schools through the H-1B visa program that borders on human trafficking. In the past, passports have been seized, the Turkish teachers’ movements limited, their earnings garnished, and their social lives and basic freedoms surveilled. These whistleblowers indicate a sophisticated level of control, including mandatory installation of tracking software on laptops and phones to prevent members from disclosing the Organization’s secrets. One whistleblower faced deportation from a European country after beginning to speak out about the Gülen organization’s illegal activity. Yet despite all this, Gülen remains in favor with a variety of influential Americans such as Fuller. Fuller’s defense stands as an example of the strange level of support Gülen has received from former ambassadors and agents of the U.S. who appear to operate with eyes wide shut, oblivious to the extensive fraud schemes he is running. Despite numerous ongoing criminal investigations, Fuller and key figures in the US leap to the cult’s defense. Think about it: a cult accused by a crucial NATO ally of operating a terror organization determined to overthrow its elected government is secretly running 160 charter schools and attempting to influence the international relations of the United States, and we are simply asked to look the other way. We believe those schools are operated by cells of Gülen’s followers, with the primary purpose of exploiting the public education sector to benefit one person only—Gülen. Turkey has every reason to question the position of the United States in this matter, just as the U.S. would question other nations hosting similar criminal organizations. While asking Turkey for evidence of Gülen’s coup mongering, we should also be asking the American government why, with numerous audits, investigations, and evidence of wrongdoing by the Gülen Organization available in the public record, we still give this dangerous cult safe harbor. Robert Amsterdam is the founding partner of Amsterdam & Partners LLP. The firm has been appointed to represent the Republic of Turkey with regard to a global investigation of the unlawful conduct of the Gülen organization.